Spotted right in our area! Right down by Lacy St. and Ave 33. Luckily it is behind a huge barbed wire fence and doesn't look like it can fly away anytime soon. Heard the owners of it sometimes play down at Mr. T's Bowl. Flyin' Burrito Brothers "6 Days on the Run"
You hit on one of my favourite loacals. I used to want to climb that fence cuz of all the cool signs and the amazing victorians behind'em. 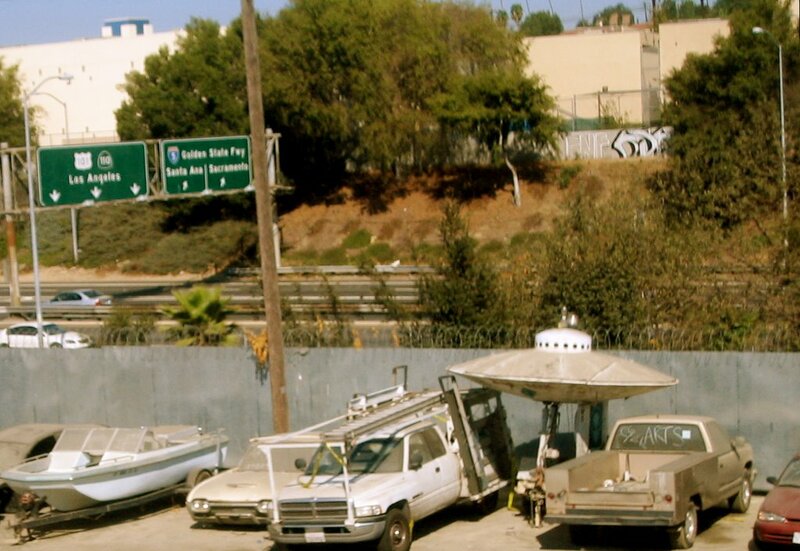 I pass that spot on the Gold Line -Always wondered what the history of the saucer was. For a while, this UFO was parked next to a burger joint over on Vermont and Fountain. (Just around the corner from Scientology headquarters.) Can't remember, but I think it may have had purpose before it was used to promote the burger place. Oh, and what gets me really excited to see at this OPG (Official Police Garage)is the 1960's Amphicar (Boat Car) located just to the right of the UFO. Really!? Is that what that is? Awesome. Gotta get down there again and take some more pics. Thanks for the info Walt!